A few metres away, at the front of the supermarket, shoppers can choose from a vast array of nicotine cigarettes — Winfield, Marlboro, Benson & Hedges — and rolling tobacco. All these products are, of course, legal and widely available. Nearby, in the neighbouring suburb of Beaconsfield, is The Steamery, a vaping products store where customers can buy vaporisers, starter kits, just about everything connected with electronic cigarettes and vaping. The one thing The Steamery can’t stock is nicotine liquid, which remains illegal. E-cigarettes are legally available in Britain, the US, the EU and now New Zealand and Canada. Australia is the holdout. E-cigarettes, battery-powered electronic devices that heat and vaporise a liquid to deliver inhal­able nicotine vapour from a metal device, do not produce the tar, carbon monoxide and most of other cancer-causing chemicals of combustible cigarettes. According to the Australian government’s QuitNow program, tar is the particulate matter generated by burning tobacco. Tar, which causes cancer, is not produced by vaping; nicotine, in both cigarettes and e-cigarettes, does not cause cancer. Two out of three Australian smokers will die of a smoking-related illness, and it’s widely accepted that smoking cuts the average life expectancy by 10 years. The federal Health Department says smoking kills about 19,000 Australians every year. Yet the most dangerous nicotine product, the standard issue cigarettes we all grew up with, are available everywhere, while the far less dangerous e-cigarettes that have helped wean millions of smokers away from tobacco are available in Australia only with a doctor’s prescription. E-cigarettes are also a far less expensive alternative to smoking tobacco, potentially saving thousands of dollars a year for a pack a day smoker. 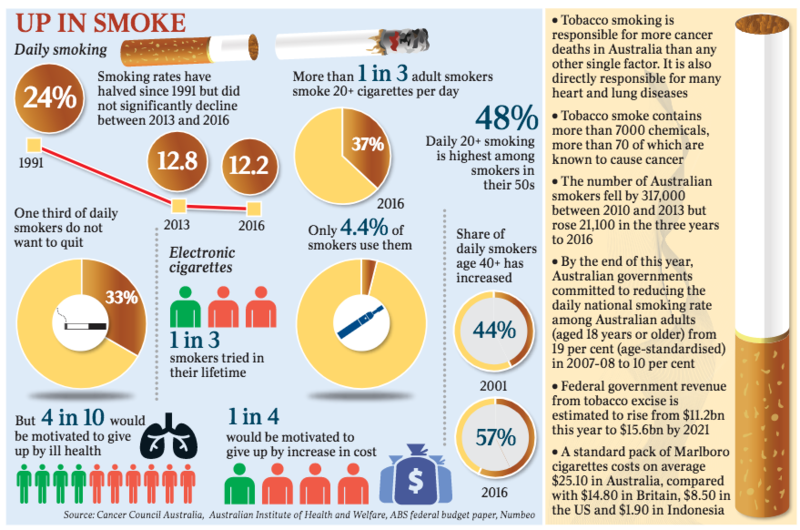 Despite decades of increasing prices, hard-hitting advertising campaigns and doctors’ warnings, three million Australians continue to smoke tobacco. Most want to quit but they just can’t. They hand over often a substantial proportion of their weekly income for some of the most expensive cigarettes in the world and they endure the nagging of concerned friends and relatives. In recent years, about 240,000 Australians have turned to e-cigarettes, despite the need to import nicotine liquid. ­According to many doctors, their health prospects immediately improved. Even so, Cancer Council Australia policy director Paul Grogan says most Australian medical and public health organisations, as well as every state, territory and the commonwealth government, support a “precautionary” ­approach to e-cigarettes — in other words, maintaining the ban. “That’s continuing to examine the evidence while explaining to people that there are significant risks involved going down the path of open slather for these products,” Grogan says, adding that any health damage from e-cigarettes may take decades to emerge. Shiny new e-cigarette products, like the many-flavoured Juuls that have become so wildly popular with US teenagers, could trigger a lifelong addiction to nicotine, he says, and the effects of inhaling chemical flavours have yet to be fully determined. Yet there are bottom-line conclusions that can be drawn. A lengthy parliamentary inquiry into the use and marketing of electronic cigarettes and personal vaporisers in Australia reported in March. Liberal Democrats senator David Leyonhjelm was outraged by the inquiry’s findings. “(Federal Health Minister) Greg Hunt leant very hard on the committee to recommend against approval,” he says. The inquiry received more than 300 submissions, many of them from Australians championing the use of e-cigarettes. One submis­sion came from Ron Borland, who works with the Cancer Council Victoria. Considered one of the most authoritative tobacco and smoking experts in Australia, with decades of experience in the field, Borland supports the use of e-cigarettes to help smokers quit. His submission, tellingly, was not associated with the Cancer Council. “To make progress with the around 10 per cent of the population we have failed (those over 30 and still smoking), the only potential solution on the horizon to the remaining tobacco problem, ie one that could make a big difference, is one that has vaporised nicotine products (ie, electronic cigarettes) at its core,” he wrote in his submission. Colin Mendelsohn, a tobacco treatment expert at the University of NSW, says Australia’s smoking rate declined across many decades but has stalled during the past three to four years. There is now a hard-core base of smokers mostly in their 40s, 50s and 60s who can’t or won’t quit. “Most of them desperately want to quit and there’s good research showing that,” Mendelsohn says. He disputes the idea that using e-cigarettes is a gateway to smoking tobacco. Despite hysteria about the Juul products in the US, adolescent smoking rates there are falling faster than ever, Mendelsohn says, adding that public health policy should be balanced across the entire population. Mendelsohn largely agrees with US Food and Drug Administration commissioner Scott Gott­lieb, who is considering restricting e-cigarettes for younger Americans, while recognising their usefulness for the “currently addicted individual adult smokers who still want to get access to satisfying levels of nicotine without many of the harmful effects that come with the combustion of tobacco”. In Australia, the Therapeutic Goods Administration opposes the lifting of barriers to nicotine liquid, and in 2016 refused even to assess a Big Tobacco non-electronic nicotine inhaler called Voke. British American Tobacco appealed against the decision, and a judge ruled the TGA had to assess the product and pay costs. The shadow of Big Tobacco has darkened the e-cigarette landscape. Most e-cigarette products come from independent producers, but suspicion of the Big Tobacco companies such as Philip Morris and British American ­Tobacco, which do have various e-cigarette products in their port­folios, has crept across the entire market. Tammy Chan, managing director of Philip Morris in Australia (which is committed to a “smoke-free future”), says the company has a smoke-free “heat-not-burn” product being assessed by the FDA in the US, which has an obligation to listen to the arguments and explain its decision. Conceding that any product from Big Tobacco attracts Big Suspicion, she says Philip Morris just wants the government to listen to the science. “Three million smokers in Australia are looking for some form of alternative, with the potential to reduce harm,” she says. One Australian firm is working on a way to legally provide Australians with nicotine e-cigarettes, without the personal hassle of importing products. Working within the existing regulatory environment, Nico­vape plans to deliver mass-market e-cigarettes using a “precautionary” approach. Founder Ryan Boulton says he understands the suspicion of e-cigarettes. Yet he says the evidence is clear: e-cigarettes help addicted smokers give up tobacco. They helped him. In 2016, he was smoking a packet of cigarettes a day, and his brother brought him a joke e-cigarette present from the US. “About two or three days after that a girl asked me for a lighter and I tapped my pocket,” he says.